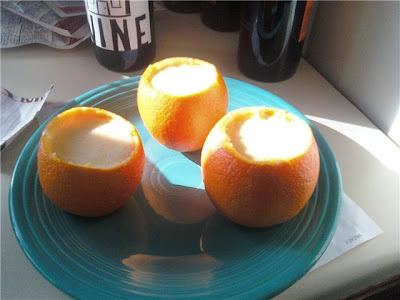 Cut the top of the orange, use a spoon to take out the meat of the orange. Careful not to make a hole. Mix sweet condensed milk with the juices. Pour the juice into the orange and put in freezer for at least 4-5 hours. This is a really good, and pretty healthy recipe. We had Japanese night at Megan's house tonight and I wanted to make a dessert. I found this while I was looking. I made three oranges at one time, and found that I didn't have enough to fill them when I was putting the juice back into the orange. I had a hard time juicing the orange to get enough juice. I had a gallon of orange juice on hand so I used that with the fresh squeezed. I would probably double the condensed milk and orange juice next time, so that the orange cups will be full. I added more, that's why mine are full in the picture. They were really good though, and basically the only calories come from the condensed milk. If you want to make it thicker you could add vanilla ice cream. I made pizza, and it was FANTASTIC. Oh, the Things You'll Find.